The Caterpillar 740 articulated dump truck is an excellent all-rounder that provides a mix of versatility, powerful performance, and innovation. Caterpillar equipment has long been an industry favourite when it comes to heavy machinery. CAT is an industry leader because of their commitment to customers and to consistently meet their needs with reliable and durable plant and equipment. 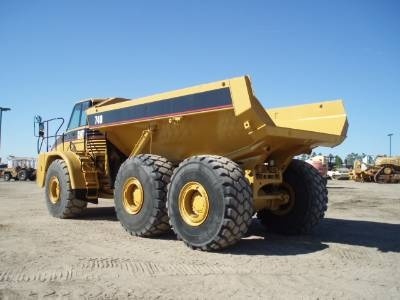 But does the Cat 740 Articulated Dump Truck (ADT) live up to the company’s reputation? Continue reading our full review and machine specifications (specs) to find out! An unexpected bonus of owning the CAT 740 is its width! Slightly narrower than other articulated dump trucks in its comparable class, the 740 can be shifted without expensive Escorting Wide Load Charges. Particularly when it comes to hiring, this is a major advantage, as the savings can be passed on to customers. 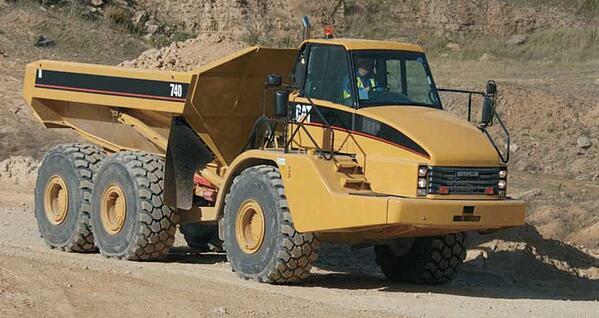 What stands out about this articulated dumper is its versatility. Designed to offer a strong, generic performance that's suitable for almost any site work, the CAT 740 specs boast several interesting technological innovations which make substantial enhancements to the machines performance. One such feature is the 740’s sophisticated traction control which ensures even weight distribution in harsh terrains, not to mention reduce risk to gouging expensive tyres. Another point of difference is the machine’s engine that has powertrain manufactured into its design. This innovative engine provides a considerable amount of power while maintaining excellent fuel efficiency. An additional noteworthy feature includes the widespread gears (two reserves and five forward) which ensure any driver behind the wheel can produce the power they need – without hindering the machine’s performance or endurance. An exceptional and reliable all-rounder, the Caterpillar 740 articulated dump truck is a first choice with many contractors and operators. When it comes to handling, CAT has really pulled out all the stops to ensure that the 740 ADT gives you more. The machine interior benefits from an ergonomic design, as well as gauges, dials, and indicators that are simple and clear to read. Straightforward icons make it easy to recognize what function belongs to which control. Visibility is pretty good, while seating for two is always a bonus. Comfort is likewise a priority, with an "Air ride" seat offering plenty of options for individual adjustment. 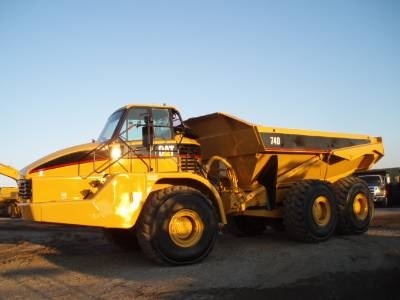 The steering wheel is also able to be moved into a comfortable position, ensuring operators can spend long hours in the CAT articulated dump truck cab with no ill-effects. Overall, the machine’s layout, design and controls have been well designed with an operator’s comfort and safety as a top priority. 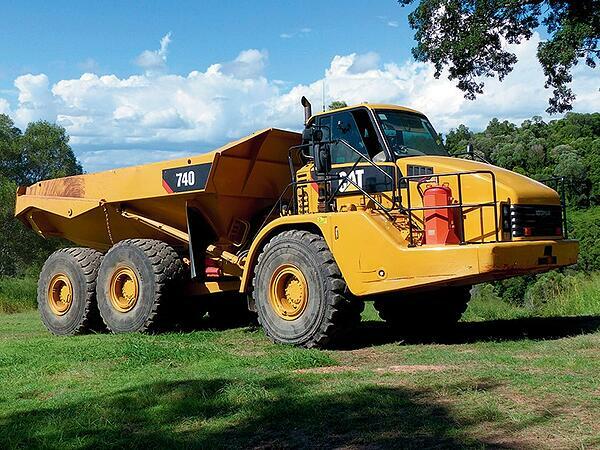 Nobody wants to spend hours making sure their articulated dump truck is fit for purpose - not only does maintenance cost money, it also limits the time your ADT has available to work. That's why CAT have put in a number of features that significantly reduce the amount of care the articulated dump truck requires. The front and back frame of the 740 articulated dump truck is enhanced by robotic welding which successfully improves its durability and helps the machine withstand extremely harsh work environments. Excellent CAT 740 dump truck specs offer innovative suspension to minimize the risk of shock fractures or other issues, while superior hitch production, tough service brakes and added protection for the radiator all help to keep the ADT in one piece for longer. The Caterpillar 740 has been designed to make maintenance a breeze – with numerous attachments and components being able to be easily removed without extensive dismantling. This means that the ADT’s engine does not need to be dismantled to perform routine maintenance or to replace components such as the radiator or its transmission. As time frequently equals money when it comes to maintenance, these types of innovation go a long way towards ensuring that CAT 740 specs offer excellent value-for-money in the long run. Environmentally friendly working isn't just great for the planet, it's also an important way of keeping your production costs low. The Caterpillar 740 articulated dump truck has been designed with air-to-air after cooling (ATAAC), wastegate turbocharging, a hydraulic fan and a variety of other gadgets and gizmos which help to drive down the amount of energy needed for the CAT 740 ADT to do its thing. 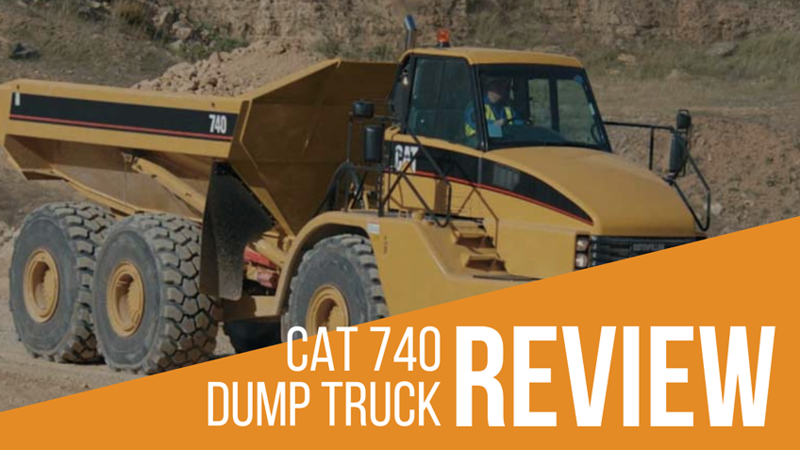 The CAT dump truck 740 specs have been engineered to minimise the risk of expensive repairs by including well-constructed parts and components. In conjunction with measures to reduce the amount of pollution emitted as exhaust fumes, these other attributes combine to form a machine that is ahead of the pack when it comes to eco-friendly working. The 740 ADT is engineered to be a versatile, multi-terrain machine – it’s one of the key benefits of purchasing this articulated dump truck over others. What this means in practice is that if you've got a load to transport from A to B, this dump truck will get the job done, regardless of what lies between the two points! This machine is a great option for challenging environments, with its advanced technology ensuring adequate grip and good balance on uneven gradients, slippery surfaces, and similar extreme circumstances. Built for flexibility, the high-performance Caterpillar 740 ADT is an excellent choice for construction, earthmoving, mining, bulk earthworks, quarrying and more. The Caterpillar 740 articulated dump truck is a popular choice in construction simply because it is an extremely reliable and high-performance machine. When it comes to comfort, control, and stability, this vehicle benefits from 21st Century innovations. This includes a powerful engine, outstanding handling, and modern technological advances that ensure CAT’s 740 ADT performs well, has optimal fuel efficiency and keeps machine maintenance costs low. If you want a high-grade articulated dump truck that gives you consistently good results, this machine stands out from the crowd.